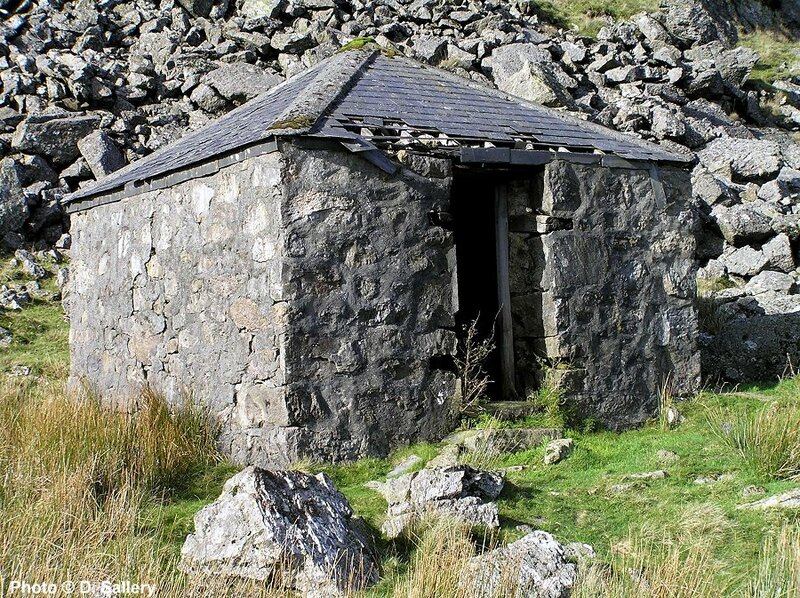 Very little remains of Manod's history but one reminder of the past is this delightful old powder store, once used to keep the quarry's explosives secure. These structures were always situated some distance from the quarry, in this case near the tramway. 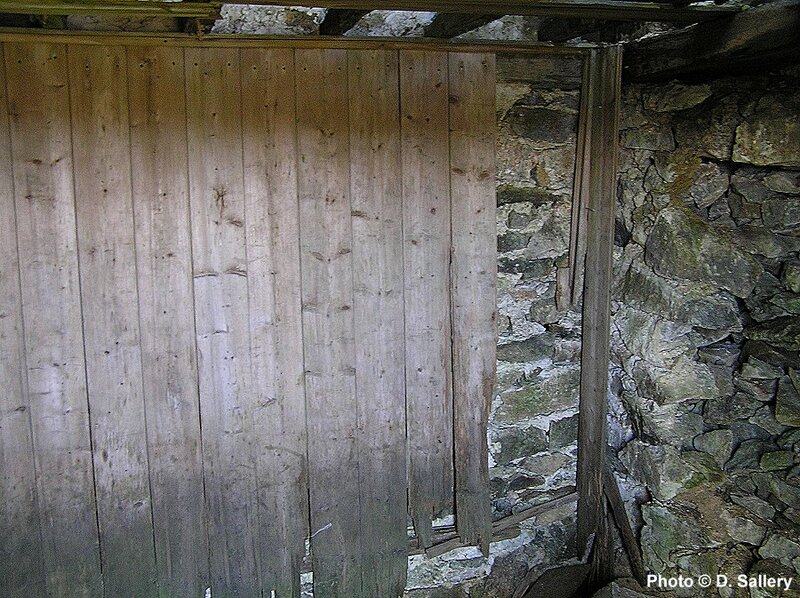 It was standard practice to construct them with a wooden floor, thick wooden faced walls and a flimsy roof, after all - accidents will happen! The mountain of Manod Mawr has had a long history of slate extraction, the earliest workings dating from over 200 years ago. 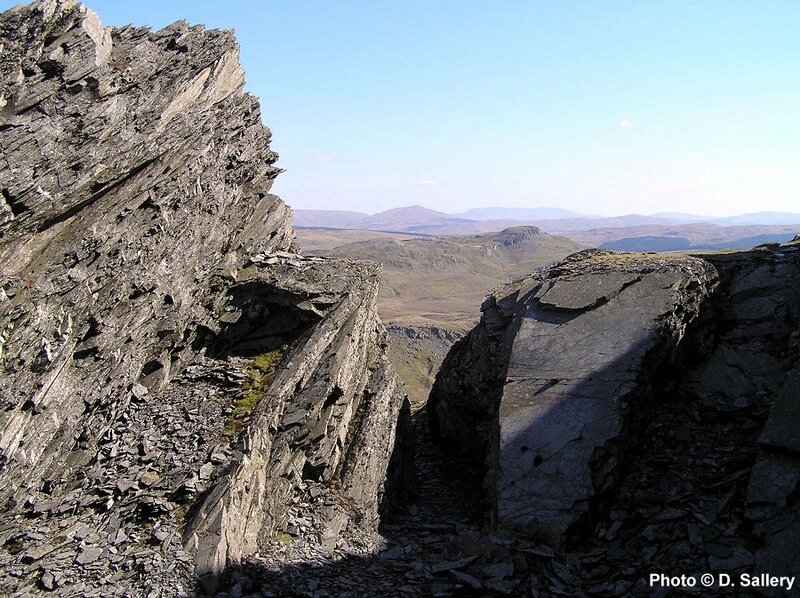 Both sides of the mountain have been exploited for slate, on the North side most notably at Graig Ddu - famed as the quarry where the men used the "ceir gwyllt" or wild cars to descend the inclines after work. The present Manod quarry, also known as Bwlch y Slaters at one time, dates from the middle of the 19th century and it was mainly worked underground. Connection was made to the Rhiwbach tramway in 1866. One curiosity of the tramway connection was that it involved the use of a reversing spur to gain height. The quarry used the tramway to transport its slate until the 1930's. It was never a major player in the industry and seldom produced over 1000 tonnes per annum. One well kept secret of Manod's past has only become public knowledge in the last 20 years. At the start of World War 2 the Government was looking for a secure site for some of the nation's art treasures. The fear of invasion and damage by air raids was of great concern and it was thought that underground storage would provide a solution. Manod was chosen as being sufficiently isolated and bomb proof and arrangements were made to requisition some of the underground chambers. An air conditioning plant was installed, brick partitions were erected, narrow gauge tracks were extended and specially designed wagons were built. The road up Cwm Teigl was improved and during the early years of the war LMS and Great Western Railway lorries laboured up the steep hill from Blaenau carrying some of the nations masterpieces. The whole operation was kept top secret. Although the masterpieces were removed when peace returned, the Department of the Environment was strangely unwilling to vacate the site. Following a long court battle by a local quarry owner, the Government finally surrendered control of the caverns in the early 1980's. The long awaited unveiling of the "secret mountain" was a curious anti climax, many rumours had circulated over the years as to what was still hidden there, the truth however was rather more mundane - just some old packing cases and long disused shelving. Now that control of the quarry was back in local hands, a vigorous programme of untopping the chambers commenced. This continued until recently with a large part of the top of Manod Mawr removed through opencasting. The quarry became part of the Alfred MacAlpine empire - then the largest slate company in the world. There was much investment in modern earth moving machinery and state of the art sawing and dressing machines. The result was a typical modern industrial unit with very little left of the original buildings, inclines or underground workings. Due to problems at MacAlpine's the quarry closed in September 2007. It has since reopened under new ownership. One curiosity of MacAlpine's ownership was their decision to rename the quarry as Cwt y Bugail. This is not to be confused with the derelict quarry of the same name some 2 miles away. This is explored elsewhere in this website. North Pole quarry was an early predecessor to Manod. It was a small open quarry higher up the slopes of Manod Mawr. Waste rock from the working was simply tipped down the mountain through the cutting in the centre.